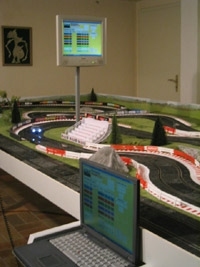 DataRace2 is a Freeware program that displays race data from the N-Digital Slot car system. The accuracy of the data displayed is limited by the data being sent by the N-Digital Powerbase. 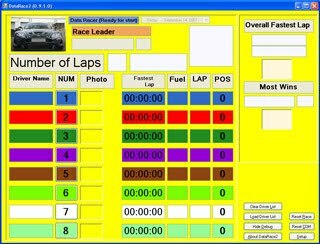 This is meant as a quick way to display driver position and fuel data on a PC screen. Unfortunately, in-race lap times are not available, as the Powerbase does not currently provide that information. 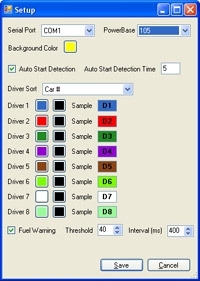 Individual fastest lap times can be downloaded at the end of the race, after the proper buttons are pressed on the Powerbase. (1/29/2010) Yes, you can use a "USB to Serial adapter", that is how I connect to my laptop. Just make sure it's got the drivers for your particular windows operating system. Please report any feedback or problems to DataRace2@stracker.com. Prevent "driver leading" audio from playing more than once a lap. Adjusted logic to better calculate out of order PB messages. DataRacer2 is free software; you can redistribute it and/or modify it under the terms of the GNU General Public License as published by the Free Software Foundation; either version 3 of the License, or (at your option) any later version. DataRacer2 is distributed in the hope that it will be useful, but WITHOUT ANY WARRANTY; without even the implied warranty of MERCHANTABILITY or FITNESS FOR A PARTICULAR PURPOSE. See the GNU General Public License for more details. You should have received a copy of the GNU General Public License along with this program. If not, see http://www.gnu.org/licenses/. Thanks to PerCentage Corp for letting me work on this project during my tenure there.